Lens came without cap, but it's shown in the descriptions, I had to buy one. Item as described. Fast shipping. Recommended seller. I really like this lens, and have been recommending it to any friends I know who own a Nikon. For less than $200, this is a quality lens that takes pro-level photos - even in minimal light. Do yourself a favor and purchase one of these beauty's today and take your photography to the next level. Things I enjoy about the lens: - I get fantastic quality in every photo - It's lightweight and hardly takes any room in my camera case - Can drop it down to f/1.8, which is fantastic for low-light and helps get that nice blurred background you've been wanting - Made by Nikon - It works on both FX and DX camera bodies - It's less than $200 - Versatile/staple lens for many situations Things that could be seen as cons: - It's a "prime" lens, so 50mm is what you get (but, makes it simple) - The Autofocus does not work on DX camera bodies below the 7000 series (though the manual focus is easy to use) Overall: - Buy this lens - you won't regret your decision at all. 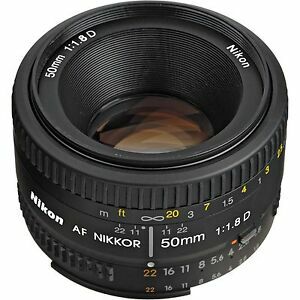 I ran across this Nikkor lens while shopping for the 1.4 to use for my daughter's video project with my Canon 5DMII. It was such a bargain and the reviews so positive that I purchased the lens and love it. Mounted on the Canon 5DMII, the camera becomes unobtrusive and better than the huge 24-70 mm zoom when out and about for street photos. The 1.8 is plenty fast compared to the f 2.8 on the 24-70 mm zoom with the Canon 5DMII. I later acquired the 1.4 and I find the images taken with the 1.8 Series E to be almost indistinguishable. Of course, the same advantages and limitations reported in my review of the 1.4 lens apply - shallow depth of field when shooting wide open, probably not as sharp as the Canon version of this lens, manual focus can slow you down but manually adjustable aperture, much faster and nonetheless beautiful images for the price of a Canon lens.